Chi Machine Patents, Awards and History. 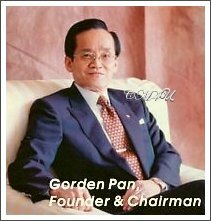 Hsin Ten Founder: Gordon C. Pan. Chih-Tai Chiu, and Jui-Yuan Yen. HTE International Company (Hsin Ten Enterprise). The Head Office of Hsin Ten (Health and Wealth) International Inc., was established in Taipei, Taiwan in September 1990. Since then, corporate offices were established in 11 countries - Malaysia, Hong Kong, USA, Thailand, China, Australia, Indonesia, Australia, Canada, Mexico, Vietnam - as well as two logistic centers in Germany and S.Africa. and four outstanding dietary supplements. Chi Machine Patents and Awards. * Chao Chin Enterprise Co. Ltd. was founded. (Predecessor to Hsin Ten Enterprise Co. Ltd.). Sep.1990 - Hsin Ten Enterprise Co. Ltd. was founded and the Sun Harmony Aerobic Exerciser was introduced. Researched and developed by a joint venture between Taiwan and Japan. Manufactured in Hefei, China as of 2002. 1993 - The Ministry of Health and Welfare in Japan approved it as a remedial medical device twice over. License No: O2B 1539 and 02B 0694. 1993 - USA grants UL approval for electrical safety - File #E133341. Sep. 1993 - HTE signed the contract for technical cooperation and worldwide sole agent with Japan's SkyLite Industry Co., Ltd.
1993 and 1994 - The Chi Machine awarded the Silver Eagle Award for the Best Product at the 2nd Asia Pacific Direct Selling Congress. 1995 - Hsin Ten won first prize during selections for the outstanding Commercial and Industrial Enterprises Awards and was awarded with a gold medal for achieving excellence in industry and commerce in 1996. November 1996 - Hsin Ten headquarters became the first direct selling company in Taiwan whose quality management system was approved by Lloyd's Register Quality Assurance Limited under the Quality Management System Standard - LRQA ISO-9002. November 1997 - 86.33 acres of land was purchased for a production base in Hefei City, Anhui Province, China. 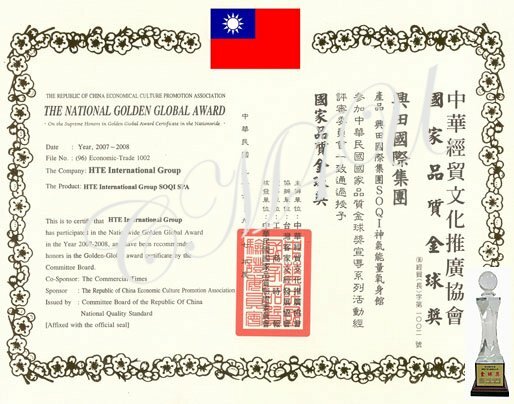 Same month, Hsin Ten awarded outstanding Enterprise Award. Asian Patents 1990, USA Patent 1992, International Patents 1994. Today there are now patents in 26 countries as of October 2004 including: America 510 7822 and 329499, Australia 59411/94, Germany G9208487.7 and Great Britain 202 3294. Chi Machine Trademark Reg. No. 2 338 684 and Sun Harmony Trademark Reg. No. 2 087 528. June 2000 - Research partnership formed with Flinders University, Australia for Chi Machine clinical trials. 2001 - Regulated as a Class 1 Therapeutic Massager in the USA. 2001 - Listed as a medical device by the Australian Registry of Therapeutic Goods Administration (ARTG), AUST L 81810 in Australia. April 26th 2001 - Licensed as a class 2 medical device in Canada, #28813, medical device regulations section 36. August 2002 - First of three head offices in Mexico established, thanks to Rafael Garcia Pelayo a great humanitarian, who works from his heart to prove that dreams do come true! November 2004 - Head office in Los Angeles established for West coast and exploding Latino sales. 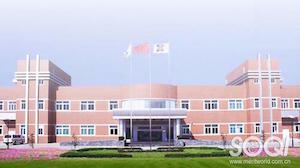 March 2005 - Factory in Hefei passed ISO13485 and certified as medical equipment manufacturer. a) Well over 2 million sold worldwide. c) Highest quality industry construction standards. d) Not one Chi Machine returned due to injury. e) The Sun Ancon Chi Machine carries $10,000,000 in product and public liability insurance. f) The original and the only Chi Machine to be subjected to clinical trials. g) Approved by a government health dept. (Japan), as a medical remedial device, twice. h) Used in hospitals, clinics, rehab-centers by both alternative and conventional medical practitioners worldwide. 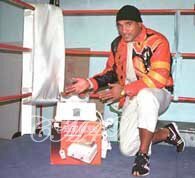 Outstanding Australian sports celebrity Solomon Haumono endorses the Chi Machine for daily training as does world boxing champion Kosta Tszyu. Other athletes endorsing the Sun Ancon Chi Machine include tennis pros, golfers, martial arts students, football and basketball teams. October 18th, 2007 - The SOQI Spa receives coverted Golden Globe Award, Taiwan. 2008 - Eighteenth year of health and medical industry proven track record worldwide, with impeccable credentials. 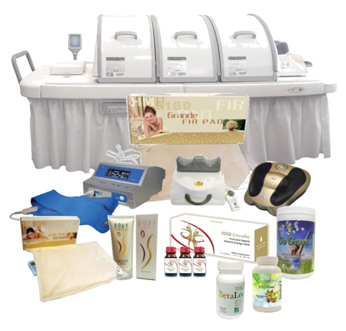 SOQI Spa Health Centers can be found throughout Asia, Australia and Mexico and growing rapidly in USA and Canada. Autumn 2008 - A new head office in Vietnam. 2012 - New modified Chi Machine with wider footrest and quieter motion - internal mechanism remains untouched, one speed only. April 12th 2013 - Another showcase on a prestigious, award winning, daily TV health show, aired in 118 countries. 2014 - 25yrs and still going strong - cutting edge technology that makes a difference. EXCITING: New social media technology - ISOQI Cloud - to be introduced in China, including direct hook up between clients and their doctors, to share and monitor computerized results and progress of the healing machines for each individual client. 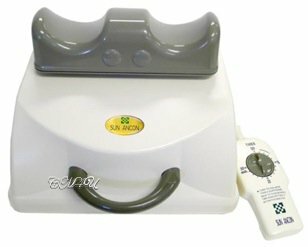 2015-2018 - A rapidly growing number of Western doctors, chiropractors and medical practitioners are referring patients to the original 'Sun Ancon' Chi Machine and also the other holistic healing machines from HTE: The Far Infrared Dome 'sauna', the Electro Reflex Energizer (ERE - electro-reflexology) and the E-Power Machine (electrotherapy for the entire body). 2019 - The SOQI Bed now has built-in bluetooth technology and interacts with an online EMD machine and App, to program individual sessions. Singapore, Thailand, Vietnam - USA. Please let us know if any head office address has changed or you cannot get a response. Chi Machine International is an independent distributor for HTE. Designated International World Headquarters 1999. 7F., No.219, Sec. 2, New Taipei Blvd., Xinzhuang Dist., New Taipei City. HSIN TEN ENTERPRISE (M) SDN.BHD. USA - HTE Americas, Established 1993. Orders, inquiries - Warehouse and Repair Center. NOTE: All products are shipped from Los Angeles, CA. HSIN TEN ENTERPRISE (HONG KONG) LTD. 22/F., OMEGA PLAZA, 32 DUNDAS ST., Mongkok, Kowloon, Hong Kong. Home of Bianca Life Products with complex chain stores throughout China. NOTE: Head office Sydney was closed January 17th 2018.
seen on the machine and on the timer. HSIN TEN INDONESIA - HEAD OFFICE - JAKARTA. Offices also in: Surabaya, Medan, Padang, Bali. HTE (SINGAPORE) PTY LTD - HTE Asia Pacific. NOTE: Head office Toronto closed October 31st, 2017. HSIN TEN ENTERPRISE MEXICO, S.A. DE C.V. NOTE: All three head offices were closed in 2015. All orders now go thru the USA - Shipment only within the USA. Officially opened October 2nd, 2010. No. 21 St. 40 Binh An Ward, Dist Q2, HCM City. CNA-HTE Vietnam Co., Ltd.Binh Duong Head Office Address: 42 VSIP Street 4, Vietnam Singapore Industrial Park, Thuan An Town, Binh Duong Province. Danang Branch OfficeAddress: 66 Vo Van Tan Street, Chinh Gian Ward, Thanh Khe District, Danang City. Hanoi Branch Office Address: No 52 - BT4, Van Quan - Yen Phuc Urban Area, Phuc La Ward, Ha Dong District, Ha Noi City.